From this Monday the controls and security measures are intensified even more: prohibited backpacks in the square of the Obradoiro and the transit of trucks. These days of the year are undoubtedly the most attracting pilgrims to the city of Santiago de Compostela, pilgrims who rush their pilgrimage along the Camino de Santiago to reach the holy city in its greatest day of the year , On 25 July. This Tuesday, festive throughout Galicia, will be celebrated as every year the Feast day of St. James and the day of the autonomous community, being the day with the largest transit of pilgrims throughout the year. For this important day for the Galicians and for the Camino de Santiago to pass without any inconvenience, the security forces and bodies of the city will redouble their efforts to shield the security of Santiago de Compostela. The security is extreme during this Monday 24 and Tuesday 25 with an "extraordinary device" of agents and resources, as announced by the Delegation of the Government in Galicia, who did not want to specify the exact number of troops to patrol in uniform and civilian these days the city. The local police units of the Santiago de Compostela Police Station have been duly reinforced with Civil Guard personnel and specialized units of the National Police to increase the city's security, with the aim of preventing delinquency, channeling agglomerations of citizens and avoid all kinds of incidents. Until this Monday has extended the so-called "intensive security" phase to pass this same Monday to the "critical phase", which will take an even more comprehensive control. 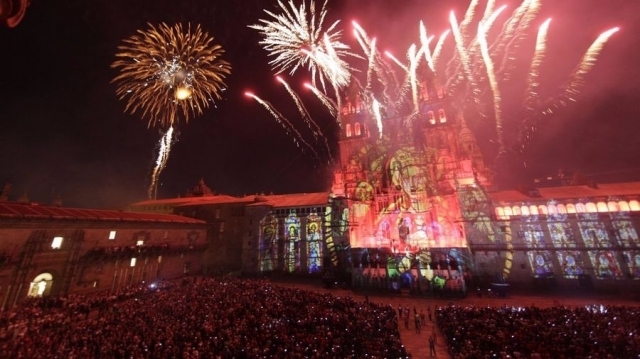 Pilgrims and citizens who have moved to Santiago Cathedral this weekend will have noticed that it is prohibited to enter all kinds of backpacks, however during the evening of Monday 24 the ban extends to the whole square Of the Obraoiro, where the traditional fireworks will take place accompanied by an audiovisual show to celebrate the Feast of the Apostle Santiago, followed by musical performances. Security measures also extend to traffic in these days, with the traffic of trucks being banned throughout the city.